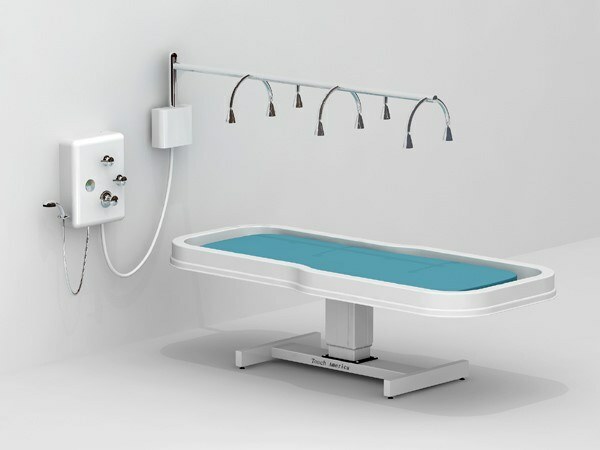 TouchAmerica's Vichy Shower provides hydrotherapy efficiency and comfort for the therapist, keeps your overhead and maintenance to an absolute minimum, and creates a memorable spa experience for your clients. The Vichy Shower features 8 adjustable showerheads w/ shut-off, thermostatic mixing valve, thermostat, handheld shower wand, and a swiveling rainbar. Shown with Neptune Battery table (sold separately).